Who among us wouldn’t choose Bossypants’ complicated legacy if it meant selling three million books? When Tina Fey’s collection of autobiographical essays was published in 2011, its wildfire success launched a new generation for the celebrity memoir. Gone were the staid, self-congratulatory books from old cowboy actors and their loyal ghostwriters. Gone, too, was the raunchy, confessional nostalgia of something like The Kid Stays in the Picture. The name of the game was idiosyncrasy, self-deprecation and relatability, fueling countless sales of books from Mindy Kaling, Jim Gaffigan, Lena Dunham, Aziz Ansari, etc. But as soon as these books began to overwhelm the market, the aw-shucks-ness of the whole thing began to feel disingenuous. The trend was so well established that by the time Anna Kendrick released Scrappy Little Nobody in 2016, you couldn’t fault her for how awkwardly that title landed or how uneasy this new “stars: they’re just like us” campaign was beginning to make people feel. It was bigger than any one individual book. 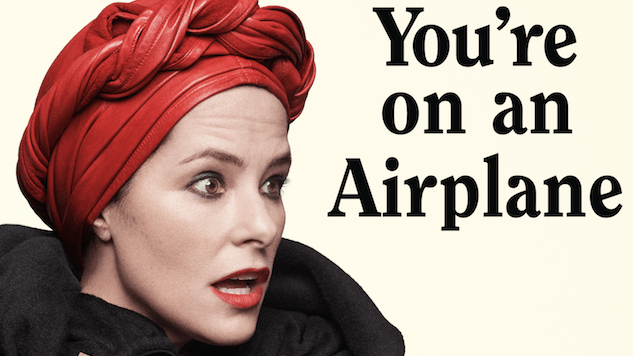 It’s within this context that Parker Posey’s new memoir, You’re on an Airplane, enters the fray. Posey, the definition of a performer with a well-defined comedic personality from her roles in Dazed and Confused, Party Girl and as a member of the Christopher Guest ensemble, announces her intentions right away in the book’s pointed subtitle: “A Self-Mythologizing Memoir.” The framing narrative is equally caustic—you’ve been seated next to legendary character actress and “Queen of the Indies” Parker Posey on a flight, where she is going to spend the next 300 pages ranting at you about her life and career in show business. It’s a reliable way to puncture whatever story she’s telling and let a little air out, and it allows Posey to lean into the casual name-droppery and faux-bashfulness that characterize this new breed of memoir. It also poses a central question and problem for these books, however, one that You’re On An Airplane is uniquely posed to investigate: Can you deconstruct Hollywood’s past while still longing for it? But there’s a world where showbiz isn’t perverse, and it’s the future the entertainment industry is striving for right now. Indeed, the stories that Posey shares from both her childhood and her present reflect the kinder, more patient world to which she contributes, from instructions on yoga exercise to the relief she’s felt since divorcing herself from the poles of New York and Los Angeles by living in Vancouver. The book really flies when Posey uses her airplane rambles to gear-shift into brief, anecdotal stories about, say, hopping out of a moving car as a child without quite knowing why. These erratic non-sequiturs buck the new comedy memoir’s convention of packaging memories into a particular essay’s overarching theme. That’s when the book successfully de-mythologizes both Posey and Hollywood itself, revealing that we can leave the conventions of mythology behind. Perhaps, we should. Graham Techler is a New York-based writer and comedian. You’d be doing him a real solid by following him on Twitter or on Instagram. A real solid.